Arnie’s unwilling gameshow gladiator garrottes a hockey player, chainsaws a biker through the nuts, and Uzi 9mm’s down a horde of studio henchmen in a bitter, violent climax. Cue the end credits to roll with John ‘St. Elmo’s Fire’ Parr launching into one of the most sincere, embracive tear-rock ballads ever penned. ‘You and me we’re all that matters,’ the Nottingham romeo croons with heartfelt purpose. Out of place? Possibly. But for those seeking tenuous links to the action may point to Parr’s ‘you hit the right spot!’ line which possibly (and wryly) references the film’s main antagonist who has just been propelled explosively through a billboard. Genius. This dumb-but-fun Stallone vehicle features a preposterously overblown shootout against a gang of Social Darwinists, and a main villain who is impaled and burned inside a factory. It’s full-on, violent stuff. Curious then, that its standout musical showpiece should be a sombrely infectious ballad about — one presumes -—the never-ending search for real love. After all, Tepper can’t surely be singing about Sly’s brutal vigilantism…can he? Given that Tina Turner cameos in the third Mad Max film, it was only fitting that the leggy soul diva should contribute its principle anthem. Less fitting perhaps is that said ditty is a major-key, synthpop powerhouse loaded with saxophones and a children’s choir, which (rightfully) went onto become a chart smash. At least its lyrics about oppression and false hope are linked to the film’s post-apocalyptic, gladiatorial violence. Ex-Ozzy drummer Carmine Appice’s King Kobra lend the hair-rock histrionics to this airborne action romp. Unlike the love-based balladry preferred by the likes of The Running Man, this track was a literal call-to-arms ode about standing up in the face of adversity, atypically softened by squealing vocals and giant slabs of sumptuous keyboard. Arguably the saddest and most poignant track in the list, the Jerry Goldsmith-penned It’s A Long Road became the theme for Stallone’s tormented Vietnam vet, and was subsequently used in the franchise’s three sequels. However, given that the bodycount rose steeply as the franchise built, the song’s moody introspection and social comment felt somewhat stunted in the face of such escalating and unsubtle bloodshed. Action movie power ballads can typically be divided into two camps: the sultry, craving tearjerkers, and the gym-bound fist-raisers designed to kickstart the hairs on the back of your neck into performing sweaty chin-ups. No track better personifies the latter than Esposito preaching to underdogs everywhere that ‘nothing’s ever gonna bring you down!’ One listen to this and even the England football team might start winning a few matches. Keeping faith with the Karate Kid tournament theme, Van Damme’s bone-snapping breakthrough Bloodsport told the true story of US man Frank Dux’s victory at an underground martial arts tournament. Music-wise, the movie’s adrenaline surge anthem riffs on Duran Duran with a sped-up, Oriental-themed keyboard lick, before ducking into a sequence of ringing major chords and unleashing its killer blow in the guise of vocal break-up as Stan Bush war-cries ‘I fiiiiight to surviiiiiiive’. Masterly. 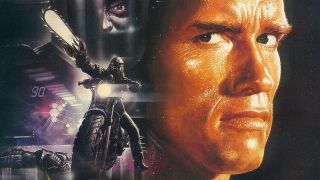 If John Parr’s entry for the The Running Man raised your eyebrows by appearing somewhat non-synonymous with the dystopian horror that preceded it, this saccharine sweetener for the Mel Gibson-starring Lethal Weapon may remove them straight from your head. The music makes the rather tenuous observation that ‘Even love can become a lethal weapon…killing you, that’s the last thing love ever meant to do…’ Contrived and bizarre? Certainly. Unashamedly enjoyable? Undoubtedly! This last slot was a toss-up between American Ninja’s 3 Cobra Strikes (that particular obscurity sounds like Scott Walker singing Journey’s Who’s Crying Now), but in the end we were KO’d by the proggy overtures of John Cafferty’s Hearts On Fire. While it may not be no Eye Of The Tiger, the sound of those deft, Wakeman-like keyboard licks snaking around it searing, power-pop chorus refrain is the only thing capable of sizing up to Drago’s genetically modified biceps – not to mention Rocky’s unifying speech at the movie’s climax.